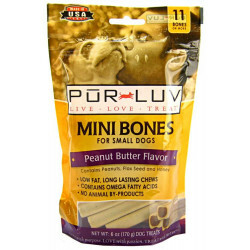 Pur Luv Chewy Bites are delicious, nutritious treats your dog will love! These treats are low in fat and made with natural ingredients like peanuts, honey and flax seed. 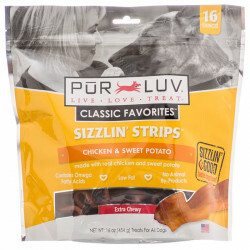 With a variety of yummy flavors, Chewy Bites are great for training or treating and are made in the USA. Pur Luv Hide 'N Treats are a convenient and easy way to give pills or capsules to your dogs without the struggle it would normally take. Simply hide a pill or capsule in the yummy, flavored treat, pinch it closed, and watch your dog delightfully get its treat and its medicine. Pur Luv Healthy Support Biscuits combine a wheat free blend of whole grain, chicken, carrot and pumpkin for a nutritious treat for your dog! 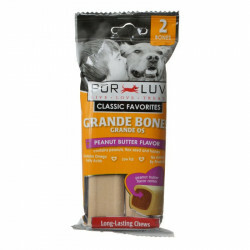 These low fat, crunchy biscuits are great for both your dog's overall and dental health. 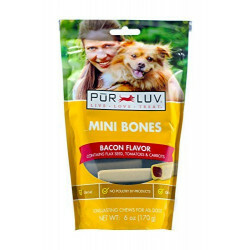 Be sure to browse all of our Pur Luv pet products to make sure you find just the right healthy, yummy, loving treat for your dog. 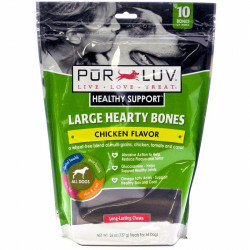 Pet Mountain is pleased to be a leading vendor of great Pur Luv pet products. 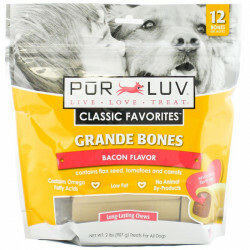 Pet Mountain is proud to offer you a wide selection of Pur Luv pet products, at the very best prices available anywhere! Take a look at all of our huge selection of great deals! Can't find something you're looking for? Let us know! We'd love to help. Be sure to check out our online coupons and discount shipping on all your favorite products.